P&O Ferries is a wholly owned subsidiary of Dubai World and operates ferries from the United Kingdom to Ireland and Continental Europe (France, Belgium and the Netherlands). These were previously operated at different times as separate subsidiaries of the Peninsular and Oriental Steam Navigation Company (P&O) under the names Pandoro Ltd, P&O European Ferries, P&O Portsmouth, P&O North Sea Ferries, P&O Irish Sea and the joint venture P&O Stena Line. MV Patria Seaways, ex Lisco Patria, TT Traveller, Stena Traveller, TT Traveller, Stena Traveller – Steel motor vessel, built by Bruces Verkstad AB, Landskrona , Sweden (Yard No. 21) and fitted out by Mekaniske Verksted, Trondheim, Norway (Yard No. 51) in 1992 as a passenger and roll-on roll-off car and commercial vehicle ferry, for Stena Rederi AB, Goteborg. GTS Urzela, ex Princesa Voladora, Flying Princess – Aluminium 929-100 series Jetfoil high speed passenger ferry built in 1976 by Boeing Jetfoil Industries, Seattle, Washington, U.S.A. (Yard No 007). MV Talya I, ex Countess M, Leopard – Steel twin screw motor vessel, built in 1968 by Ateliers et Chantiers de Bretagne, Nantes (Yard No. 16/109), fitted out at Dubigeon-Normandie S.A., Nantes as a passenger and vehicle ferry. MV GNV Cristal, ex SNAV Sardegna, Pride of Le Havre, Olau Hollandia (II) – Steel twin screw motor vessel built in 1989 at Schichau Seebeckwerft AG, Bremerhaven, Germany (Yard No 1067) as a passenger car and commercial vehicle trailer ferry. MV GNV Atlas, ex SNAV Lazio, Pride of Portsmouth, Olau Britannia (2) – Steel twin screw motor vessel built in 1990 at Schichau Seebeckwerft AG, Bremerhaven, Germany (Yard No 1068) as a passenger car and commercial vehicle trailer ferry. MV Pride of Hull – Steel twin screw motor vessel, built in 2001 by Fincantieri-Cantieri Nav. Italiani S.p.A. (Breda), Venedig, Italy (Yard No. 6066), for P&O North Sea Ferries, Rozenburg, Holland as a passenger car, and commercial vehicle roll-on roll-off ferry. MV Pride of Rotterdam – Steel twin screw motor vessel, built in 2001 by Fincantieri-Cantieri Nav. Italiani S.p.A. (Breda), Venedig, Italy (Yard No. 6065), for P&O North Sea Ferries, Rozenburg, Holland as a passenger car, and commercial vehicle roll-on roll-off ferry. MV Pride of York – ex Norsea – Steel twin screw motor vessel, built in 1987 by Govan Shipbuilders Ltd, Glasgow, Scotland (Yard No. 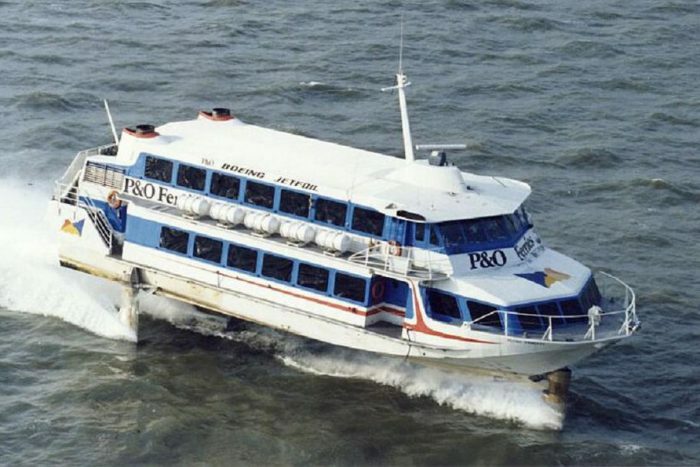 265), for North Sea Ferries (P&O Group), Hull, England as a passenger car, and commercial vehicle roll-on roll-off ferry. MV Pride of Bruges, ex Norsun – Steel twin screw motor vessel, built in 1987 by NKK, Tsurumi, Japan (Yard No. 1033 ), for North Sea Ferries (Nedlloyd), Rotterdam, Holland as a passenger and vehicle ferry. GTS Horta – Aluminium 929-115 series Jetfoil high speed passenger ferry built in 1981 by Boeing Jetfoil Industries, Seattle, Washington, U.S.A. (Yard No 16).